Ok I am certainly guilty of not staying on top of this Blogging BUT my little life has been ram packed with stuff going on since January... I am now a new dad to a lovely little boy born in March! Urgent plans had to happen to make more space in the house which involved building some sort of outside office for me to function. It has taked for ever to build and went fiercely over budget but not only do I have a boy but I am a proud owner of an official man cave in the garden. Wow! - its great and so much space to at least feel prepared to get sorted and to plan for the next few months. So apologies to everyone but I am slowly getting back to normality again! So we have had one of the most awful start to the year with the weather.. but finally we are starting to see some sun again albeit sporadically and the cider drinking season is now well under way. We have only been to a couple of shows but we were very lucky with the weather and there were good turnouts for both shows. No real 'new' shows this year as I have struggled a bit with formulating a proactive attack regarding the cider business, as there is only so much I can do BUT we are still sort of holding our own. We are only doing the shows that we know work well for us and of course there is only so much we can physically do. The brown tourist signs on the road identifying we are, are working very well indeed and we are certainly seeing more visitors at the shop. The problem of people particularly relying on Tomtom sat navs... and then turning up at the neighbours has been drastically reduced. There will always be some people who utterly rely on these machines and will drive past the signs but there is only so much you can do! Regarding the farm we are in the process of applying for the Higher Level Stewardship Scheme. This is a comprehensive environmental improvement plan that is grant funded. Until recently we have been so busy we have not seriously been able to consider it. The preparation for the scheme was originally daunting (as you would expect) . Lots of data have to be collated and firm environmental improvement plans have to be in place for longevity. What has helped is that we have had the opportunity of the original Environmental Plan being done for us as part of the project. Also it materialises that we are already doing a number of the requirements. A little bit more assistance and we would be able to implement some fairly big plans on the farm. Not confirmed yet but it has certainly got out interest! So plenty of stuff going on! A reawakening of the Mahorall Farm Cider Blog!! Yes it has been a while but it has returned as a summary of 2017. 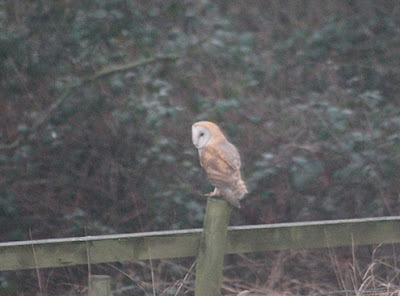 What a way to start off the New Year by capturing this beautiful barn owl sitting on the fence! Farm work was kick started in Mid January with one of the biggest projects on the farm which I have undertaken for a long time. It involved coppicing a 260 metre length of Hazel hedge which was part financed by a Stewardship Scheme. Hazel is an excellent wood to coppice to ensure longevity of the hedge and the project has also provided a vast amount of timber. The hedge was located on fairly remote corner of the farm and safety was paramount as I was working on my own. The nearest point of the hedge was over 300 metres from any road and if the weather was wet then I could not drive over to the site without making a mess. Welcome to Mahorall Farm Blog for 2018. Here is a summary of what has been going on the farm during each month. Only a handful of cider shows this month which included Weston Park and Much Wenlock Christmas Fayre which was a total of 3 show days. After a busy year it was quite nice to have a more gentle month for the run up to Christmas. I have to say that 2013 has been a year to remember for all sorts of reasons. Looking back on the year it has been one huge roller coaster and I have loved every minute of it! This year has been very good for for all sorts of reasons and one is how generous mother nature can be with harvests. As Autumn approached we were blessed with a great crop of damsons on the farm which was a great relief. Had some lovely weather to pick them too and really enjoyed the experience. On one side of a particular hedgerow there is one of the best views on the farm overlooking into Herefordshire. With the fine weather, lovely extensive views, solitary bliss and eating fresh damsons like sweets! Fond memories indeed!